What is PayPal for Digital Goods ? PayPal for Digital goods is specially designed service offered by PayPal for Business selling digital products online.Digital products can be images,videos,ebooks,softwares and other similar products.It is tailor made to benefit sellers selling low cost digital goods.By low cost I mean sell price of item is less than $10.So if you are selling any ebook or offering a software for less than $10 then this service will benefit you. Here on this website I am offering few downloads for less than $10.Also many websites do not require full fledged solution of Shopping Carts.A visitor buying ebook on WordPress Setup will not be interested in C programming ebook.So as a seller you will like to sell the item directly without requiring seller to navigate through different pages.In case you are trying to setup shopping cart then PayPal for Digital Goods may not fit your requirement. Buyer should be able to buy the item without navigating to other products or going to add to cart or checkout pages.Moreover the best Buyer experience would be if he / she can purchase the item without leaving your website.PayPal for Digital Goods offers the solution.Later in the post we will discuss about Buyer experience in detail. I have mentioned above that it enhances Buyer Experience for Digital goods.Lets see the work flow from Buyer’s point of view.Lets assume that you have placed a Buy Now button on your website.So normally after clicking on that button Buyer goes to PayPal website.There the payment is made. 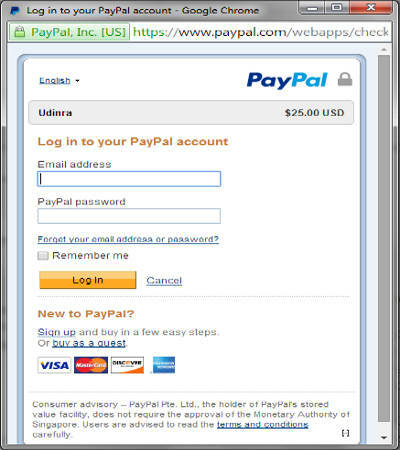 But in case of PayPal for Digital goods buyer after clicking on button a pop up window is shown to the Buyer.So visitor is still on your website.Buyer can make payment on that pop up.The payment options and payment experience is similar to that of PayPal page.Below is the pop up window displayed once the Buyer has clicked the Buy Now button placed on your website. You can visit this page to have demo of the service. PayPal for Digital Goods is cheaper then other solutions offered by PayPal.This is in fact the strongest argument in favour of using this service.PayPal charges less fees for low cost digital goods in case of PayPal for Digital Goods .Below is example calculation to show the difference between PayPal fees for other services and PayPal fees for Digital goods. PayPal Fees (2.9 % + .30 cents ) if you have sales volume equal to or greater than $3,000 per month. PayPal Fees (4.4 % + .30 cents) if you have sales volume less than $3,000 per month. I have used 5% and 6% both in above calculation.As I have seen both percentages mentioned on PayPal website.Never mind in both the cases sellers gets the benefit.So for Micro payments PayPal for Digital Goods is way cheaper then other alternatives. Even it is cheaper than the merchant rates offered in other services.So for small or big publisher selling digital items with cost equal to or less than $10 PayPal for Digital Goods is the way to go. It supports payment using PayPal account as well as Debit cards and Credit Cards.So your visitor can make payment even if they do not have PayPal account.So payment option wise it is at par with other PayPal services.It supports Express checkout and Adaptive payments.Subscription payment is also supported by Express checkout mode of PayPal for digital goods.The Adaptive payments mode supports Multi party payments.You can compare both the modes and features available on this page. One thing is worth mentioning here is that Express checkout option is easier to implement.The adaptive payments option is difficult to implement.So from development point of view Express checkout option is the way to go.The implementation section of this post focus on express checkout option only. You can integrate PayPal for Digital Goods inside your games or other applications created for mobile devices.It can also be integrated into Web games and applications as well.So you can have visitors pay and then play a game. I will not cover implementation details in a Game or mobile application in this post.As these topics are broad and not in scope of this tutorial.But I will discuss implementation of it on a WordPress website. On My Selling Tools page you can see option API access under Selling online. Click on the update option next to API access. Click on the option 2 as shown in the image. After that on next screen you will see Credential,API Username,API password,Signature and Request Date.Copy API username,API password and Signature.We will need these information while adding PayPal for Digital Goods on our website. In case you are using WordPress then you can use PayPal for Digital Goods plugin.You can download the plugin from this link.You need to enter API username,API password and Signature on plugin configuration page.This is it.I have tested this plugin.It works pretty well. In above code replace the texts as per your requirement.This plugin also shows gives you sales report.Currently major eCommerce plugins does not support PayPal for digital goods for free.But we can expect more plugin offering support for this service in future. Which online payment option you are using? Consider sharing the post in case you found this useful.